EDS460-DG insulation fault evaluators are used in combination with the ISOMETER® IRDH575 or the PGH insulation fault test device to localise insulation faults in DC power supplies (IT systems). The test current signals generated by the insulation monitoring device IRDH575 or the insulation fault test device PGH are scanned by measuring current transformers and evaluated by the insulation fault evaluators. 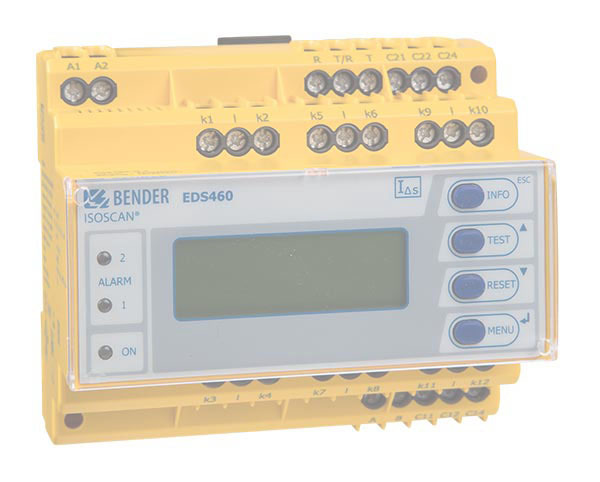 Up to 12 measuring current transformers can be connected to one EDS460-DG. If more than 12 branch circuits are to be monitored, up to 90 EDS evaluators can be connected via an RS-485 interface (BMS protocol), thereby 1080 branch circuits can be monitored. The maximum scanning time is approx. 4…10 s, see TGH1429. This device version is particularly suitable for systems involving high system leakage capacitances (20000 µFV, see characteristics in the chapter “Technical data”). EDS460-DGW.. Version for increased climatic and mechanical stresses.